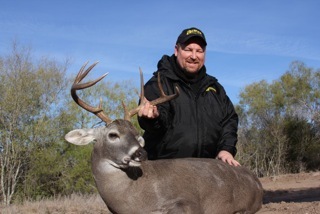 Eric harvested this deer on a hunt in Texas in 2012. The act of responsible hunting is something that all hunters and firearms industry companies should pursue, support and promote. Distance aside, there is no sensible reason why a hunter should take a shot at a game animal in which the hunter couldn’t hit the center of the vital area 9 out of 10 times. On this, we should all agree. It is important to understand how advancing technologies allow for this end result to be accomplished. The idea of fair chase is, at its core, simply an idea. As an idea will, it means different things to different people. I’d offer that the most literal application of fair chase is to go into the wild, barefooted and grab a rock or a stick you come across on the way. Essentially anything added to this experience is using technology to overcome the game’s senses. The hunting experience is just as intimate and real for those who use tree stands, calls, feeders, blinds, decoys, trail cameras, scent concealer, compound bows and the numerous other technology advancements in the area of hunting. We agree 100% that no shot should be taken that is not certain of success. The question is, how does advancing technologies factor into this success? Precision rifles that are capable of consistent, lengthened trajectories provide significantly improved shot placement due to reduced drift and drop. Just because a hunter has a rifle that can hit targets consistently at 1,000 yards doesn’t mean that this is the distance at which they engage game. Most animals taken with longer range capable firearms are taken at distance far short of their capable range. Range finders, environmental measuring devices and trajectory calculators allow a hunter to be certain of his shot placement situation regardless of range. These devices are not utilized only when the game is at distance, but at any distance they are engaged. Well made, balanced bullets with sleek designs not only improve shot placement capabilities, but they also increase the amount of energy on impact further ensuring a quick and humane harvest. We fully appreciate the effort and the experience one goes through in working to get closer to an animal. However, for many hunters in the modern era, this activity is not as stimulating as the endeavor of developing a precision rifle and their skills with practice and patience. Such efforts applied by a responsible hunter are certain to produce an ethical outcome while at the same time being a fully enjoyable hunting experience. 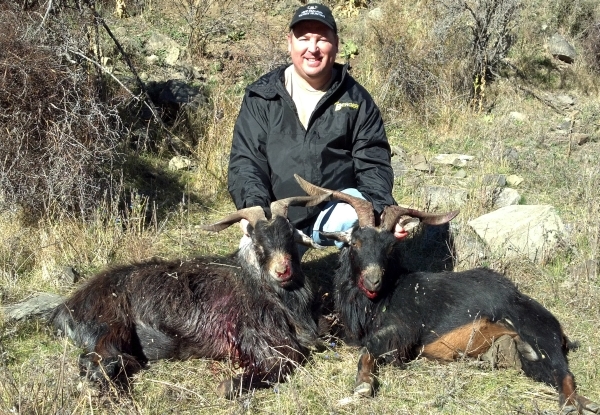 Eric Stecker, President of Berger Bullets, with two billy’s he harvested in New Zealand. For those who want to get closer because that is what excites them about a hunt, we encourage them to do so and we will celebrate with them their accomplishment. If they take a precision rifle into the same situation, they’ve increased their likelihood for success that much more by utilizing improved shot placement and higher impact energy capabilities that come with this advancement in technology. None of these advancements are preventing those who want to get closer from doing so. Hunting is about the experience. Being a responsible hunter is about the individual. Those who are responsible will act accordingly regardless of what technological advancements they take into the field. It is not certain that the person commonly recognized as founding the idea of fair chase, Theodore Roosevelt himself wouldn’t own and use a precision rifle if he understood how it incorporated improved shot placement and higher impact energy capabilities into his own hunting experience. In the end, the important idea is that we should all be responsible hunters, and those of us who are in the industry should promote this idea. Berger Bullets started testing our hunting bullets in West Virginia on hogs and not a shot was taken over 75 yards. The next test was in New Zealand where multiple dozens of animal were harvested. Most of the animals were taken at 175 yards or less with a few in the 300 yard range. Walt Berger has been a sportsman all his life having run trap lines in Ohio at the age of 9. He’s taken one animal at “475 steps”. All of the other animals he recalls over his numerous decades of active hunting were taken at distances less than 150 yards. When we started promoting the use of our bullets for hunting, it was not our intent to become regarded as a “long range” hunting bullet. It just so happens that our bullets are well balanced and designed with sleek profiles. This results in better shot placement and higher energy on impact. Both of these things are useful to any hunter and provide the hunter with nothing more than options. It is irresponsible for a hunter to assume that using our bullets can give them the ability to shoot to distances they haven’t already practiced with confirmed success. To assist in communicating the idea of responsible hunting, we are initiating a hunter education effort. We are making targets available that can be downloaded and printed on an 8.5” X 11” standard sheet of paper. You can download them from our Vital Zone Hunting Targets page. On this target will be an actual size representation of the vital zone area of various different game animals. We strongly encourage those who use our bullets or any bullets for hunting to download this target and place it at any distance at which you feel capable of hitting the center of the vital area 9 out of 10 times. If you can do this, then you’ve proven that you are acting responsibly when taking a shot at this distance. Our objective is to further educate that our bullets are not made to achieve long range kills for the sake of distance. They are made precisely to improve shot placement and are designed thoughtfully to allow higher levels of energy on impact. The distance at which a hunter chooses to apply these capabilities will ultimately come down to the character of the individual and their abilities.